Cancer of the thyroid gland is easy to survive but hard to find unless you’re really looking for it. Doctors say those with a family history of the disease ought to make the effort. 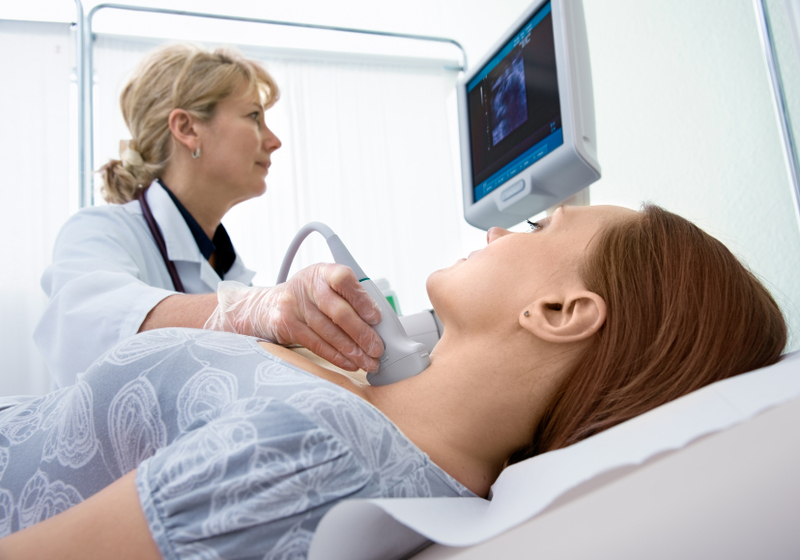 Few Americans would list thyroid cancer as a health condition they worry about. Although it’s among the ten most common types of cancer in the United States, and diagnosis rates continue to rise, the vast majority of thyroid cancers grow slowly and respond well to treatment. Thyroid cancer wasn’t something Dr. Stacie Chasin worried about, either, even after her mother and uncle were diagnosed with papillary thyroid cancers in 2011. Chasin, an internist in Goshen, New York, initially shrugged off the advice that she have an ultrasound to see whether she had the cancer, too. The thyroid is a butterfly-shaped gland about 3 centimeters wide that sits below the Adam’s apple. 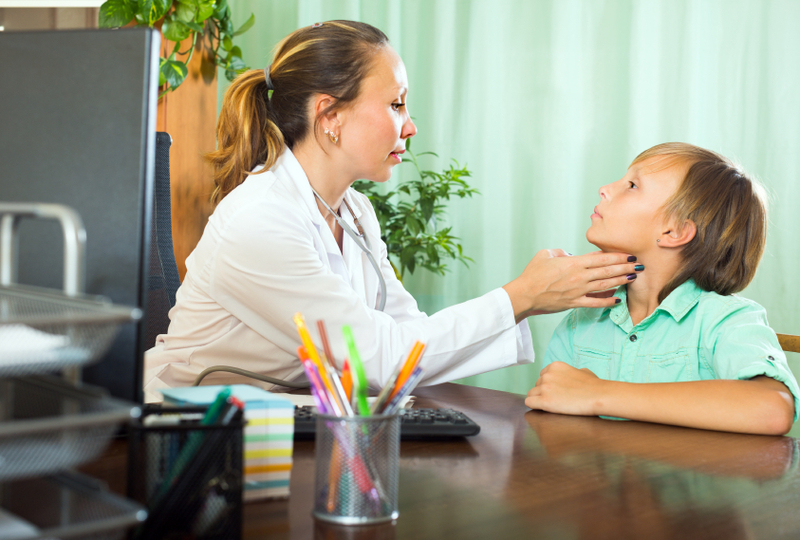 Nodules, or growths, on the thyroid are not uncommon, and most are benign. But the nodules are so small they are hard for doctors to find. Most are discovered accidentally when patients undergo imaging tests for other conditions. A thorough physician’s assistant noticed a bump on Chasin’s mother’s thyroid during a routine exam. In 2013, Chasin stopped by the radiology department that sits next to her office to get an ultrasound done and end her family’s nagging. The test detected a single large nodule, which also turned out to be a papillary cancer. Chasin had her thyroid gland removed and now has to take synthetic thyroid hormones every day. Once a year she gets tested to see if the cancer has reappeared. January is Thyroid Awareness Month in the United States. The genetic pathways that explain the tumors in Chasin, her mother, and her uncle remain a mystery. Patients often look back on it like it was a speed bump. It ends up being a nothing if it’s detected early and treated. Papillary thyroid cancer is by far the most common type. Doctors don’t know why it clusters in families. They do know that medullary thyroid cancers, which make up just 5 percent of all cases, can stem from a genetic syndrome called Multiple Endocrine Neoplasia. “Papillary thyroid cancer has genetic associations — I think I would just leave it at that. There’s a familiar pattern to incidence, but it’s not a very obvious and linear one,” said Dr. Marita Teng, an associate professor of otolaryngology at the Icahn School of Medicine at Mount Sinai. Teng operated on Chasin and her mother. Because thyroid cancers found early are so easy to treat, Teng recommends that those with a family history of the condition be screened, as Chasin eventually was. Who Should Get Checked, and How? Chasin’s mother’s cancer was more advanced when it was discovered. She had to be treated with radioactive iodine, which forced her to isolate herself from her family while the radiation faded. Her cancer will likely grow back repeatedly, forcing her to have repeat surgeries. Chasin agrees that screening is the smart move for those with a family history of the cancer. The bad news is that routine laboratory tests, which show levels of thyroid hormones in the body, don’t reveal anything about possible thyroid cancers. There’s some controversy about whether patients who don’t have a family history or any symptoms should worry about thyroid cancer. The debate is similar to the one surrounding prostate cancer: Most of these tumors are so slow growing they really only need to be watched. Yet, when doctors and patients know they are there, it’s hard not to try to treat them. For those who believe knowledge is power, some doctors recommend self-examination of the thyroid at home in front of a mirror to check for any changes. The self-exam involves leaning the head back and swallowing a sip of water. Any bulges in the thyroid area should be looked at by a doctor. “That type of basic screening is, like any other type of self-exam, not a bad idea. And if there’s anything that comes up, it’s not a bad idea to see a doctor,” said Teng.